This was a fascinating keynote investigating how we can consider the options we face in project management as being Options in the financial sense: they expire, they have a value and we should avoid committing to them too early. Being able to take options requires you to have slack time in which to take them: Chris used the analogy of the lion who is an effective predator because he spends most of his time asleep in a tree. Taking options also involves considering how we will roll back a decision. There was a warning against using mathematical probability to decide what is unlikely to happen, because human beings tend to be too optimistic when calculating risk. Instead, we should aim to have a plan for what we will do if the risk occurs. The other strand in this talk was around staff liquidity. All too often, we allocate people to tasks because they are the expert in that field. This just creates silos and dependencies on individuals. Instead, we should aim to keep the experts for training other people or for responding quickly to unforeseen circumstances. Marcin’s talk considered the best ways of collating feedback on what we do. The main thing I learnt was about the relationship between the Cynefin model and the appropriate feedback loop to use. Marcin demonstrated how Complex problems should be considered using the OODA loop, while PDCA is more suited to Complicated problems. One area in which I wasn’t so happy was the idea that Simple problems don’t require feedback because there are established practices. Surely those practices themselves have room for improvement? This talk also had two parts. The first was a reminder about normal distributions and standard deviations. If your business asks for a 6% increase in sales in the next 6 months, this is meaningless if the 6% is within the natural variability of the measure. All too often, we forget this, because we just look at the output from a spreadsheet.Francis suggested that we should put the standard deviation on all the graphs we produce for management to highlight this issue. The second part of the talk described the distinction of ‘efficient’ and ‘effective’: the former is best for a short-term bottom-line but is high-paced and so there is little room for innovation; the latter is more about the long-term, and allows for innovation and experimentation. The final slide contained an interesting note: that we need to be ‘response-able’ for improvements, i.e. that we need the slack time to improve. I always appreciate conference talks where companies feel able to give a ‘warts-and-all’ presentation, owning up to simple mistakes they have made. This was one such talk as Alun described a big project at AutoTrader which involved releasing some software by a critical date. Having estimated that it wouldn’t be possible, the company threw a load of contractors at the problem, hoping that it would speed it up. But the product was still delivered when it was originally estimated, and all that they had achieved was a lot of stress. It also appears that some fundamental mistakes with prioritisation of the individual components of the system could have been done better, which might have helped some of the project to have been delivered earlier. Tomasz had tried using the YouTrack system to create YouGame: a gamification of the story-points achieved. This was initially done in response to a particular set of issues, including tasks moving straight from ‘To Do’ to ‘Done’ on the board, and inaccurate estimation. Tomasz described the issues he had faced in various iterations of the game’s development, including the risk of the leaderboard being used for performance bonuses (not the intended use! ), and the need to add a concept of ‘stamina’ to prevent people from marking excessive amounts of work as Done. To me, it sounded very much like an excessive response, and it must have taken a lot of time to create the app, however impressive it is. I’ll admit to having seen a practice of this presentation at Red Gate a few weeks ago but this made it even more interesting for me to see the eventual, finished, talk. As someone who hasn’t traditionally done many Sprint retrospectives with my team, I found the number of practical examples in Chris’ talk very useful. I’m certainly looking forward to trying many of them out. 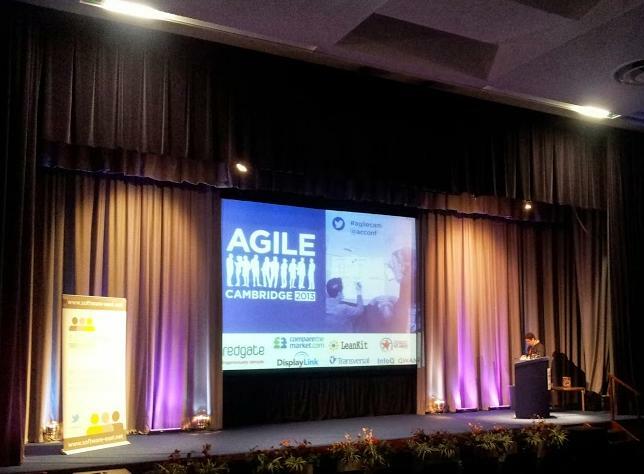 Overall, I thought Agile Camrbidge was excellent, and I hope to be back next year!